Supreme Court nominee Elena Kagan told her confirmation panel Tuesday that the landmark decision extending gun rights to all 50 states is “binding precedent,” despite a senator’s suggestion that the 5-4 ruling was on shaky ground. . . The nominee said that unless the circumstances that led to a decision change or some other significant grounds can be found to challenge, “the operating presumption of our legal system is that a judge respects precedent. … You assume that it’s right and that it’s valid going forward.” . . . Such answers could help to assuage Republicans’ concerns that Kagan would advance her political views, which they claim to be liberal, on the high court. Yet her McDonald opinion shows her “understanding” that those many, many Americans are completely wrong to think they have a meaningful individual right. Sotomayor lied. Why should we believe Kagan is any different? In addition to McDonald (a big win), we have three other cases. In Christian Legal Society v. Martinez, the court ruled that it is legal for a public university with an “all comers” policy to require religious groups to include non-believers as a condition for recognition. I think we’ll see a lot of all-comers policies now. In Bilski v. Kappos the court ruled 9-0 against bogus patents. In Free Enterprise Fund v. PCAOB, the court ruled that the Public Company Accounting Oversight Board is unconstitutional, but declined to stop it from operating, which seems like the constitutional equivalent of awarding $1 in damages. So call it a 2.25/4 record today with a big win in McDonald, which I suppose is pretty good. Kennedy was in the majority for all four decisions. UPDATE: Good analysis of CLS v. Martinez here. UPDATE: Apparently Bilski v. Kappos did not categorically rule against business methods patents. I won’t have a chance to read that decision any time soon, but I’ll link an analysis when I see a good one. The Second Amendment is fundamental to the Nation’s system of ordered liberty, rules the court. Chicago’s gun ban is remanded to the lower court, but its fate seems sealed by this decision. Only Thomas was inclined to resuscitate the Privileges and Immunities clause. At a glance it doesn’t look as though the court settled the level of scrutiny, so gun rights will almost certainly be coming back to the Court one more time before all is said and done. UPDATE: I’m glad to see the opinion discuss the racist roots of gun control. It was clearly relevant to the authors of the 14th Amendment, and even if it weren’t, it’s valuable to see the rug pulled out from under the gun-control advocates’ pretenses to the moral high-ground. UPDATE: Plaudits for Thomas’s brilliant concurrence. I originally thought it was unfair to blame President Obama for the oil spill catastrophe, but subsequent events have proven me wrong. The federal government has not merely been incompetent (which wouldn’t have been Obama’s fault); it has actively obstructed the cleanup. As far as anyone can tell, Obama has done nothing at all about it. Even now, with the spill doing untold damage to the Gulf environment and economy, cleaning up the oil spill still plays second fiddle to protectionism. How about those priorities? The semi-approval for Dutch assistance was apparently just a one-off, occasioned by bad press attention. Other equipment is still going unused. For example, the world’s largest oil-skimming ship, the “A Whale”, is headed for the Gulf, but it still doesn’t have government approval to operate. The EPA is holding it up for the same idiotic reasons as the Dutch equipment, and the Coast Guard is also holding it up for reasons that aren’t clear. Protecting the Gulf Coast is not the priority; the priority is to line the pockets of certain unions and business interests. Obviously the Maritime Cabotage Task Force doesn’t speak for Obama, and yet Obama seems to be doing their bidding. If he has a legitimate reason, he should say what it is. Thus far his administration has remained silent except to say that no Jones Act waiver is necessary. In one Alabama town, the fire chief had to defy the government and risk jail to carry out a plan to protect his coast. BP’s pathetic efforts failed within hours, as he had predicted, but still the government would not permit the locals to take steps to protect themselves. He eventually received the government’s blessing, but only after he defied their orders. Local officials say they’ve seen little improvement as their requests get bounced around, ignored or even opposed. The main problem, they say, is the confusing command structure, which to them seems to have too many generals and not enough battlefield commanders, thus gumming up the ability of local leaders to react to approaching oil. Mr. Robinson told the Monitor that requests for more help after a large swath of oil washed up on Pensacola Beach Tuesday night were initially rebuffed because central command in Mobile said they couldn’t put certain kinds of equipment on a national seashore. But most of Santa Rosa Island is a public beach. “How could they not know that?” Robinson said. The Deepwater Horizon catastrophe is a horrific mess, and there’s only so much that the president can do. But there is one way president could make an enormous difference: cut through the red tape so that people can do their best. Unfortunately, that’s one thing of which this president is temperamentally incapable. He believes in centralized power, not in local and individual initiative. This catastrophe is showing how well his model works. According to state disaster relief officials, Alabama conceived a plan — early on — to erect huge booms offshore to shield the approximately 200 miles of the state’s coastline from oil. Rather than install the relatively light and shallow booms in use elsewhere, the state (with assistance from the Coast Guard) canvassed the world and located enough huge, heavy booms — some weighing tons and seven meters high — to guard their coast. But … no sooner were the booms in place than the Coast Guard, perhaps under pressure from the public comments of James Carville, uprooted them and moved them to guard the Louisiana coastline instead. So Alabama decided on a backup plan. It would buy snare booms to catch the oil as it began to wash up on the beaches. But … the Fish and Wildlife Administration vetoed the plan, saying it would endanger sea turtles that nest on the beaches. So Alabama — ever resourceful — decided to hire 400 workers to patrol the beaches in person, scooping up oil that had washed ashore. But … OSHA (the Occupational Safety and Health Administration) refused to allow them to work more than 20 minutes out of every hour and required an hourlong break after 40 minutes of work, so the cleanup proceeded at a very slow pace. The short answer is that every agency — each with its own particular bureaucratic agenda — was able to veto each aspect of any plan to fight the spill, with the unintended consequence that nothing stopped the oil from destroying hundreds of miles of wetlands, habitats, beaches, fisheries and recreational facilities. Why? Because that’s not what this president does. The tax court rejects the “Geithner defense”, noting in passing that the IRS is under no obligation to treat all taxpayers the same. The federal government is shutting down the dredging that was being done to create protective sand berms in the Gulf of Mexico. The berms are meant to protect the Louisiana coastline from oil. But the U.S. Fish and Wildlife Department has concerns about where the dredging is being done. House Democrats are readying an alternative budget measure that would set next year’s spending levels without requiring a vote on deficits. House Budget Committee Chairman John Spratt (D-S.C.) said the alternative would be the “functional equivalent” of a full-fledged budget. But because it won’t be a traditional budget resolution, it will be silent on future deficits, which are expected to average nearly $1 trillion for the next decade. Democrats have expressed concern about voting for a document showing lots of red ink in an election year. A traditional budget resolution sets the discretionary spending levels and also lays out the majority’s fiscal policies for future years. Alternative budget measures, known in past years as “deeming resolutions,” set spending caps but lack the statement on future spending and tax policies. . .
Republicans had control of the House the previous four times Congress failed to approve a final budget resolution since 1974, when the current budget rules were put into place. But should Democrats move forward with an alternative budget measure, it would be the first time the House had failed to even propose a budget resolution. Budget rules are made to be broken, I suppose. Vladimir Putin is boasting Russia’s new T-50 air superiority fighter will be superior to our F-22 Raptor. That’s mostly bluster, I’m sure, but I can’t help noting that we don’t have very many F-22s. The Air Force decided that we could make do with fewer than half of the number we needed for a “low-risk” force, apparently because there has not been a great need for an air superiority fighter in recent conflicts. Instead, the F-22 will share the air superiority role with the much-less-capable F-35. Plus, we don’t even have the F-35 yet, so we’re relying on previous-generation technology. In fact, if some Democrats have their way, we’ll cut the F-35 as well. It appears Russia sees an opening. Mika Brzezinski, weekend anchor for NBC’s Today and co-host of MSNBC’s Morning Joe, admits to working with the White House on its talking points. I’m sure Bush is responsible somehow . . .
House Speaker Nancy Pelosi, D-Calif., recently blamed Bush appointees who “burrowed in” at the Minerals Management Service for the regulatory failures that led to the Deepwater Horizon disaster. But as it turns out, not one of the officials responsible for overseeing the exploded rig was a Bush political appointee. Interesting that only the Examiner thought to look into this. Where in fact is the evidence that Mr Obama is even remotely a “socialist”? . . . It is a funny socialism that gives private, for-profit insurance firms the main responsibility for delivering health care. Well, if the Economist thinks back a few months, I think they may recall that President Obama wanted a public health plan that would drive the private firms out of business. He wasn’t able to get his “public option”, and only narrowly got the votes for the plan that did pass, so we still have “private” insurance firms. The government is merely going to dictate what policies they write, for whom, and at what price. The government will also dictate how much they pay out, require individuals to buy their services, and pay for much of the cost with taxpayer funds. A federal judge gets rid of those pesky inspectors general once and for all. The White House can now dismiss any IG at any time without fear of legal consequences. I say it’s about time. Without all that transparency, I’m sure we’ll finally have the wise and benevolent rule we deserve. Reform must be good, right? I guess that making real cuts to the state budget is out of the question. Ed Rendell wants to close the state’s budget gap by shorting the state pension fund. Yeah, that’s not going to come back to haunt us. The best part is, he calls it “pension reform”. Judith Gans, who studies immigration at the Udall Center for Studies in Public Policy at the University of Arizona, said that what social psychologists call self-serving perception bias seemed to be at play. Both sides in the immigration debate accept information that confirms their biases, she said, and discard, ignore or rationalize information that does not. In support of its argument, the Times makes two claims: (1) violent crime is dropping at the border, and (2) violent crime is dropping statewide. The first claim is relevant to its argument, while the second is not. But they go on to provide data only for the second claim, and none at all for the first. A quick google search finds numerous articles making the same faulty argument. So where should we look for crime data along the border? The FBI statistics don’t report such figures, so we’re forced to look for a proxy. The AP looked at one proxy: the crime rate in three Arizona border towns (Yuma, Nogales, and Douglas). They found that the crime rate in those three towns has been flat. Tom Maguire looked at another proxy: the statistics for areas outside Metropolitan Statistical Areas. The only metropolitan area near the Arizona-Mexico border is Yuma, so rural crime rates in Arizona give some indication of the situation along the border. When he found was striking. While the rate of violent crime per capita in Arizona metropolitan areas dropped 20% from 2000 to 2008 (which doubtless accounts for the statewide drop), the rate in non-metropolitan areas went up a staggering 45%. The rate in cities outside of metropolitan areas went up a similar 39%. So it seems that rural Arizonans, at last, have good reason to be concerned about rising crime. Now, this doesn’t prove that illegal immigration is at fault. Indeed, I think that the drug war can be blamed for a lot of it. But it certainly does show that the New York Times is guilty of the same perception bias that it decries in opponents of illegal immigration. POSTSCRIPT: For any non-regular visitors, let me reiterate that I’m generally for immigration from Mexico. Unfortunately, today’s welfare state is incompatible with unrestricted immigration. I would rather scrap the former and allow the latter. But one way or the other, it’s certainly clear that the current arrangement — wherein we largely cut off legal immigration but permit nearly unrestricted illegal immigration — is untenable and tends not to select for the immigrants we want. ACORN may have become synonymous with underage prostitution and human trafficking, but its bread and butter is voter fraud. Judicial Watch recently obtained FBI notes from its investigation into ACORN voter fraud activities. Daniel Foster has a handy summary. POSTSCRIPT: Incidentally, ACORN is not dead; it is merely rebranding itself. Presumably they will continue their criminal activities under their new names. The Wall Street Journal recounts how the federal government dithered on plans to use oil dispersants and sand berms to protect the Gulf coast before finally approving them. It looks as if President Obama applied a little old- school Chicago persuasion to the oil executives, because BP’s chairman not only agreed to the full $20 billion that Senate Majority Leader Harry Reid and Louisiana Sen. Mary Landrieu asked for, he also pledged to suspend quarterly dividends immediately. I suspect Carville is right, but I don’t share his joy. I’m not going to shed a tear for BP, a company I’ve despised for years, but I’m very disturbed to see the continued Russification of our economy. While our economy ought to be (and largely has been) managed by free markets and the rule of law, we’re increasingly seeing coercion and back-room political deals take their place. We saw it when banks were forced to participate in TARP, when Chrysler’s creditors were forced to accept a plan that moved unions to the head of the line, and when medical device manufacturers got the shaft in Obamacare for not paying enough protection money. So I think Joe Barton was right (despite his retraction) in all his points except for the apology to BP. The apology is due to all of us, not to BP. UPDATE: The Economist calls him Vladimir Obama. Ouch. Banks are responding to new price controls by ending free checking accounts. I’m so glad that Congress is looking out for me. Despite promises to the contrary, BP and government official are still blocking media access to the oil spill. The Coast Guard shut down Louisiana’s oil-sucking barges for a day while it verified that the barges carried the required number of fire extinguishers and life vests. This comes on the heels of the revelation that the EPA blocked the use of Dutch oil skimmers for five weeks because of inflexible regulations. If the federal government were trying deliberately to impede the cleanup, do you think it could do any better? A panel commissioned by Rep. Barney Frank (D-Mass.) is recommending nearly $1 trillion in cuts to the Pentagon’s budget during the next 10 years. The Sustainable Defense Task Force, a commission of scholars from a broad ideological spectrum appointed by Frank, the House Financial Services Committee chairman, laid out actions the government could take that could save as much as $960 billion between 2011 and 2020. Measures presented by the task force include making significant reductions to the F-35 Joint Strike Fighter program, which has strong support from Defense Secretary Robert Gates; delaying the procurement of a new midair refueling tanker the Air Force has identified as one of its top acquisition priorities; and reducing the Navy’s fleet to 230 ships instead of the 313 eyed by the service. Remember that we cancelled the F-22 because President Obama’s top brass decided that the F-35 could carry the load. We can’t now cancel the F-35 as well. Frank’s task force also wants to cancel the V-22 Osprey (now that it’s finally working), scrap European missile defense, and slash our nuclear deterrent (cut warheads by a third and scrap bombers entirely). And it’s not just technology, they want to slash the human side as well: they want to “reform” military pay and health care and cut recruitment. Is Frank under the impression that the world has been getting safer? Still, kudos to him for having the chutzpah to appoint his very own panel and not even pretend to make it bipartisan. POSTSCRIPT: You want to save $1 trillion over ten years without endangering our national security? I’ve got an idea. Can a rich, corrupt lawyer buy a seat on the Federal bench? We will soon find out. It’s oddly cool, but I can’t figure out what it’s supposed to be for. It doesn’t look suitable for the disabled, and for the able-bodied it doesn’t look any better than walking. Louisiana Gov. Bobby Jindal’s plan to create sand berms to keep oil from reaching the coastline originally came from the marine contractor Van Oord and the research institute Deltares, both in the Netherlands. BP pledged $360 million for the plan, but U.S. dredging companies — which have less than one-fifth of the capacity of Dutch dredging firms — have objected to foreign companies’ participation. Better not to get it done than leave American firms off the gravy train, I guess. The U.S. Government has apparently reconsidered a Dutch offer to supply 4 oil skimmers. These are large arms that are attached to oil tankers that pump oil and water from the surface of the ocean into the tanker. Water pumped into the tanker will settle to the bottom of the tanker and is then pumped back into the ocean to make room for more oil. Each system will collect 5,000 tons of oil each day. . . The Dutch system has been used successfully in Europe. As of June 8th, BP reported that they have collected 64,650 barrels of oil in the Gulf. That is less than one day’s rated capacity of the Dutch oil skimmers. So in the twisted logic of our government, it was better not to skim off the oil at all than to skim a lot of it but put a little back. Only weeks later did they begin to consider whether that might have been a bad policy. As a result of these efforts, we’ve directed BP to mobilize additional equipment and technology. And in the coming weeks and days, these efforts should capture up to 90 percent of the oil leaking out of the well. Yeah, we’ve “directed” BP to use equipment and technology now that we forbade them from using for the first five weeks. A major security failure at AT&T, exposing 114 thousand 3G iPad owners, including the White House Chief of Staff. According to Gawker, the failure leaked not only personal information, but also the iPads’ authentication codes, which may have enabled more serious breaches. In other news, iPads are becoming extremely popular at the White House. Ugh. President Obama advocates steps to ensure that state and local government don’t balance their budgets. What a truly horrible idea. There’s no law against insider trading by members of Congress or their staff, which explains why senators’ investment portfolios outperform the market by a staggering 12.3%. In the United States, the president can’t give orders to the chairman of a private company. I’m pretty sure that Obama understands that, but I guess he thinks that his listeners do not. Perhaps he means by this that his administration will go to court to force BP to put the necessary money into escrow. But “I will inform him that I will initiate a lengthy legal battle to force him to set aside”, despite being more accurate, doesn’t quite have the ring of executive command that “I will inform him that he is to set aside” has. The irony of this is that his speech was lacking in executive command in areas that the president actually could plausibly command. (Waiving the Jones Act, for example.) His cleanup plan is a czar and a panel. But I suppose his advisors thought that promising real action was risky, and he should focus on directing fire and brimstone toward BP. The latest Rasmussen poll finds that President Obama’s popularity has hit a new low: 57% disapprove of his job performance, against 42% who approve. (That’s before last night’s pathetic speech.) Also, the GOP lead on the generic ballot is now in double-digits (46-36). Considering that Democrats ordinarily lead on the generic ballot, that is stunning. According to a new PPP poll, most Louisianans think that President Bush did a better job handling Hurricane Katrina than President Obama has handled the Deepwater Horizon spill. Also, 77% still support offshore oil drilling. One should not do data mining on just two data points. UPDATE: Even those two data points don’t work any more, just a week later. An NPR poll of the 70 most competitive Congressional districts finds that Republicans lead by 8 points. Even in the Democratic districts, the GOP leads by 5 points. Also, the mood of the electorate (at least in those districts) is not primarily anti-incumbent, it’s anti-Democrat. The re-elect number for Republican incumbents is 49%, while for Democratic incumbents it’s 34%. The story of how the Black Panther voter intimidation case came to be dismissed is becoming more clear. It’s worth reading in its entirety, but I’ll highlight a few key points after the jump. Now is when big employers are busy assembling their benefits packages for 2011. And this year, they are having to factor in the new health law’s requirements, said Pearce R. Weaver Jr., a senior vice president at Fidelity Consulting Services. . . Although most of the new law’s big changes do not take effect until 2014, there are some provisions employers must comply with by next year. That includes extending health insurance coverage to uninsured dependents up to age 26, eliminating any lifetime or annual caps on coverage and paying 100 percent of some preventive care. . . This year [Tracy Watts, a partner at Mercer Health and Benefits] estimates that changes made in response to the health law will add an extra 2 to 3 percent in cost increases, pressuring employers to engage in even more cost-sharing with employees — whether through higher premiums, co-payments or other out-of-pocket costs. Pat Leahy (D-VT) doesn’t like waiting his turn to take off at O’Hare. The Washington Post, the newspaper than mentioned “Macaca” in approximately 100 articles, op-eds, editorials about the 2006 Virginia Senate race between George Allen and Jim Webb, watches the video of Rep. Bob Etheridge, North Carolina Democrat, physically assaulting a questioner and concludes it warrants three paragraphs on page C3, in the Reliable Source gossip column. . . This is not even bias anymore; this is information management, designed to ensure those who pick up the print version of the Post never encounter what the blogosphere is buzzing about. It’s sad to see this; until recently the Post was among the most respectable of the mainstream papers. UPDATE: It seems that Etheridge has something of a history in this regard. The documents — product of a joint project of the Labor Department, the Health and Human Services Department and the IRS — examine the effects new regulations would have on existing, or “grandfathered,” employer-based health care plans. . . Note: 51% is the median estimate. The upper estimate is 69% of all firms, including 80% of small firms. And this is the Obama administration’s own assessment. The claim that people who like their insurance could keep it? That was a lie. Soldiers on Sunday freed two high-ranking police officers and an army sergeant who were among Colombia’s longest-held rebel captives in a raid in southern jungles. President Alvaro Uribe announced the rescue of police Gen. Luis Mendieta and Col. Enrique Murillo, both captured by the leftist Revolutionary Armed Forces of Colombia, or FARC, in a November 1998 siege of the remote eastern provincial capital of Mitu. Also freed was soldier Arbey Delgado, who was held since an August 1998 rebel attack on an anti-drug outpost in the southern jungle town of Miraflores, according a Defense Ministry official who spoke on condition of anonymity because the official was not authorized to speak publicly. The oil rig explosion occurred while the well was being shut down – a move that is much more dangerous than continuing ongoing drilling, they said. They also said that because the floating rigs are scarce and in high demand worldwide, they will not simply sit in the Gulf idle for six months. The rigs will go to the North Sea and West Africa, possibly preventing the U.S. from being able to resume drilling for years. They also said the best and most advanced rigs will be the first to go, leaving the U.S. with the older and potentially less safe rights operating in the nation’s coastal waters. Look what you would have made me do! I think it’s fair to say, if six months ago, before this spill had happened, I had gone up to Congress and I had said we need to crack down a lot harder on oil companies and we need to spend more money on technology to respond in case of a catastrophic spill, there are folks up there, who will not be named, who would have said this is classic, big-government overregulation and wasteful spending. POSTSCRIPT: I know this doesn’t merit a response, but I can’t help pointing out two things beyond the obvious: (1) Even if we suppose that you get to blame others for what they would hypothetically have done if you had done something different, Congressional action wasn’t required for the administration to make sure that the MMS was doing its job, or for a Jones Act waiver, or any number of other presidential prerogatives. (2) Since when does the president care what Republicans think? Republicans (and the public too) were against the stimulus boondoggle, and the auto bailouts, and especially health care nationalization, but he went ahead with them anyway. As far as his deeper point about how regulating oil drilling would violate our small-government principles, I think it’s best for us to be the judge of our own principles, thank you very much. I explained here why he’s wrong. Here’s another way in which the Obama administration is obstructing the oil spill cleanup: Although the government has supposedly reconsidered its refusal to allow the Dutch to help, Obama has not waived the Jones Act. The Jones Act is an appalling piece of protectionist legislation from 1920 that requires that all ships operating between US ports be US-flagged, US-constructed, US-owned, crewed by Americans, and repaired at US shipyards. The Jones Act makes it impossible for foreign ships to assist in the spill cleanup, since there’s no practical way to assist without moving between US ports. “Countless American vessels are already responding in the Gulf. In addition, we know that many other American vessels are standing by ready to help,” reads a statement released Friday by the Maritime Cabotage Task Force, a lobbying group that represents scores of both unionized and nonunionized employees and employers in the American maritime industry. The presser goes on to say that the maritime industry “has not and will not stand in the way of the use of these well-established waiver procedures to address this crisis,” so long as the Obama administration can prove that there aren’t American vessels willing to help but waiting in the wings. MTCF spokesman Mark Ruge confirms that his organization, which represents groups as disparate as the AFL-CIO and the Goodtime Cruise Line, has communicated its position to White House officials. Obviously American ships are not doing the job, whatever the unions might claim. But the unions are adamant that Jones not be waived until every available union sailor is on the gravy train. If some foreign ships would do a better job, well, that’s not really a consideration. Robert Gibbs claims that no waiver is necessary, and that foreign ships are already assisting in the cleanup. Perhaps he’s referring to ships working in international waters. Fox News notes that the Coast Guard admits that assistance from several countries (including the Dutch) has been refused because it doesn’t meet “the operational requirements of the Unified Area Command”. If not the Jones Act, it’s difficult to imagine what those requirements might be. A man is arrested for rescuing a 13-year-old girl. I just worry that this is the sort of arrangement that goes away when made public. The Mavi Marmara, on which Israeli soldiers were ambushed by “humanitarian activists”, contained no humanitarian supplies whatsoever. It’s sole purpose was to provoke an incident with Israel. I’ve previously written that blaming President Obama for the Deepwater Horizon catastrophe was largely unfair. The administration did have a small role in the disaster, such as the failure of the Materials Management Service to carry out effective oversight, but who really expects the president to pay attention to an unknown Interior Department agency when there’s serious business to be done like nationalizing health care and plundering our economy. (Indeed, in other industries the MMS’s attitude would have been appropriate.) Obama, I said, is suffering mainly because he over-promised what his government could do. They are blocking media access to the oil spill. (Via JustOneMinute.) That last story is from Rolling Stone, so take it with several grains of salt, but it’s confirmed by a story in the Houston Chronicle. These stories paint a picture of the federal government at its worst: insisting on command of the situation without the competence to use that command effectively, suppressing dissent, and obstructing the media from reporting what it is doing. Clearly, South Carolina Democrats nominated a weak candidate to oppose Sen. Jim DeMint this fall. But Jim Clyburn (D-SC), the third-ranking House Democrat, isn’t taking the Democratic voters’ decision lying down. He wants a criminal investigation of the race. Clyburn wants the US Attorney to investigate whether someone paid the filing fee for Alvin Greene, who won the Democratic nomination for US Senate. (I suppose a criminal investigation of the voters was out of the question.) Clyburn says that would be illegal under state law, if Greene’s candidacy is intended to hurt another candidate. As far as I can tell, Clyburn did not explain what role the US Attorney has in enforcing state election law. The real purpose of such an investigation should be clear. The purpose here is to create a chilling effect, to deter people not favored by the Democratic machine from running in Democratic primaries. If you run, and you happen to win, you face a criminal investigation. Best to stay out. UPDATE (7/10): An investigation found that Greene really did have the money to pay the filing fee. That’s right, South Carolina actually did conduct an investigation. Wow. Okay, let me make sure I’ve got this right. The left’s position is it is a terrible violation of our civil liberties to eavesdrop on foreign terrorists when they place calls to America. We should stop listening whenever they contact people here. Not only that, but it’s also a violation of our civil liberties to eavesdrop on foreign terrorists when they place internet calls to anywhere, if those connections happen to routed through the United States. A federal judge has ruled that border agents cannot seize a traveler’s laptop, keep it locked up for months, and examine it for contraband files without a warrant half a year later. U.S. District Judge Jeffrey White in the Northern District of California rejected the Obama administration’s argument that no warrant was necessary to look through the electronic files of an American citizen who was returning home from a trip to South Korea. . . The Justice Department invoked a novel argument–which White dubbed “unpersuasive”–claiming that while Hanson was able to enter the country, his laptop remained in a kind of legal limbo where the Bill of Rights did not apply. To be fair, a group of Democrats have sponsored a bill to put an end to this practice. However, as I read it, the bill would still permit warrantless searches if they were conducted within 24 hours. I was briefly worried that Nevada Republicans had nominated the one candidate who Harry Reid could beat this fall, but it appears I was worried for nothing, at least for now. Sharron Angle leads Harry Reid by 11 points, and leads by 10 among independents. Intrade briefly had the race as a toss-up, but Angle is now the favorite (60%). It remains to be seen how effective a campaigner Angle is, but fortunately the right strategy for this race is really easy. As long as she can keep the focus on Reid, she should be able to win. U.S. ships are being outfitted this week with four pairs of the skimming booms airlifted from the Netherlands and should be deployed within days. Each pair can process 5 million gallons of water a day, removing 20,000 tons of oil and sludge. . .
A Maine company converted its factory to making oil containment boom to help save the Gulf coast. Now they have miles of boom sitting in their warehouse, and neither BP nor the government is buying. UPDATE: The man in charge of the federal effort says he never heard about this. UPDATE: The Coast Guard now says that the boom didn’t pass quality tests. UPDATE: An outside analysis shows that the boom is actually superior to other boom. Unfortunately, without restricting gasoline imports, the new sanctions are unlikely to accomplish anything. But, on the (perversely) positive side, Turkey’s vote against sanctions should finally make it clear to everyone which side they are on. Of course it will never, ever happen. Those special interests are stronger today than when the 17th Amendment was passed. It’s the new model for business in the United States: advance the interests of the politically well-connected at the expense of everyone else, and the law be damned. The Wall Street Journal has an interesting exposé on the Saint Consulting Group, a firm that specializes in astroturfing opposition to Wal-Mart, funded by Wal-Mart’s competitors. For the typical anti-Wal-Mart assignment, a Saint manager will drop into town using an assumed name to create or take control of local opposition, according to former Saint employees. They flood local politicians with calls, using multiple phones to make it appear that the calls are coming from different people, the former employees say. They hire lawyers and traffic experts to help derail the project or stall it as long as possible, in hopes that the developer will pull the plug or Wal-Mart will find another location. . .
Safeway, a national chain based in Pleasanton, Calif., retained Saint to thwart Wal-Mart Supercenters in more than 30 towns in California, Oregon, Washington and Hawaii in recent years, according to a Saint project list and interviews with former employees. Former Saint employees say much of the work consisted of training Safeway’s unionized workers to fight land-use battles, including how to speak at public hearings. John McDonnell, a Labour leadership candidate, was applauded loudly yesterday for telling a trade union audience that he wished to go back to the 1980s and assassinate Margaret Thatcher. The MP later said his remarks were intended as a joke but the standing ovation he received underlined how large sections of the party remain tilted to the Left. It’s a crime to resist price controls now? An investigation by a private body of Israel’s intelligence officials has found that the Gaza flotilla activists aboard the “Mavi Marmara” who clashed with Israel Navy forces last week were part of an organized group that was prepared for a violent conflict. The report, which was published by the Intelligence and Terrorism Information Center (Malam), also found that the group was supported by the Turkish government and that Turkey’s Prime Minister Recep Tayyip Erdogan was aware of the plans for violence. Malam is a private organization that serves as an unofficial branch of Israel’s intelligence community and in the past has been a medium through which Israel’s intelligence findings were made known to the public. Files found on laptops owned by the IHH members pointed at strong ties between the movement and Turkey’s prime minister. Some of the activists even said that Erdogan was personally involved in the flotilla’s preparations. UPDATE: Erdogan’s fingerprints are all over the incident. If the law is applied as written, 1 million people who are currently insured will lose their insurance in September, and most will go uninsured until 2014. The story, however, leaves open the possibility that the administration might not implement the provision “strictly”. How does that work, when the law requires it? Basically, the administration might not enforce its own bill. And by “might not”, I mean “won’t”. After all, taking away health insurance from 1 million people just two months before an election would spell disaster for Democrats. On the other hand, if they don’t enforce it, who is going to complain? Certainly not Republicans, who opposed provisions such as this in the first place. But that doesn’t mean that million people are safe. The Democrats have been very consistent about their desire to outlaw payout caps. They might put it off — in violation of their own law — for electoral advantage, but they’re committed to doing it. Expect to see it strictly enforced starting right after the election. When risk and profit are properly aligned in competitive markets, government regulators are simply meddlers. In such cases I would laud them for going along with whatever private enterprise wants to do. (It would be better yet if such regulators simply didn’t exist.) But once the taxpayer is on the hook for the risk of a private enterprise, the taxpayers are depending on those regulators to manage the risk. In this case, the regulators failed miserably. So I support the proposal to remove the cap on oil spill damages. Some Republicans have objected that doing so would drive small drilling companies out of business. If that is so, then oil drilling has a natural economy of scale and the small players just shouldn’t be in the business. But I’m not convinced it is so. Removing the cap may make it impossible for drillers to self-insure, but that doesn’t mean that it they couldn’t buy insurance. Today (as far as I know), there is no one who will insure against that sort of risk in the United States. And why would there be, since the taxpayers have assumed that risk? But, if oil drilling is a workable business for small companies apart from the risk, then insuring them ought to be a profitable business. POSTSCRIPT: This is not to say that I’ll support whatever bill the Democrats put forward to lift the cap. Knowing them, I’m sure they’ll find a way to make it unacceptable. POST-POSTSCRIPT: Another major contributing factor to the disaster are the restrictions on oil drilling on land that have forced oil exploration so far off-shore. We ought to be pumping the oil that’s safe and easy first before moving deep into the ocean. Health care nationalization may be years from going into effect, but it’s already forcing health insurers out of business. nHealth, a new insurer based in Virginia is closing because it wasn’t able to raise additional capital. You certainly can’t blame the investors. nHealth’s business model was based on personal responsibility, high deductible plans, and health savings accounts, exactly the sort of health insurance that President Obama wants to put an end to. The new Hungarian government says that Hungary’s previous government cooked the books and lied about the state of the economy. Without knowing anything about the facts in the matter, I’ll say it’s very plausible. The previous government was run by the MSZP, Hungary’s former communist rulers, so it seems pretty likely they would lie about the economy, that being the standard practice of communists. There’s a saying I’ve heard from accountants: recessions uncover what auditors can’t. When a company has reasonable cash flow and access to credit, dodgy practices can be hidden for quite some time. But when sales dry up and banks tighten the purse strings, eventually companies are forced to admit that there is no money in the till. That’s why recessions always seem to be accompanied by revelations of terrible accounting practices, which makes a lot of people think that an epidemic of dishonest accounting must have brought the economy to its knees. But there’s not much evidence that accounting practices actually get worse at the end of booms; it’s just that companies who might have gotten away with it and eventually made enough money to repair the hole in their balance sheets, instead are forced to disclose what they’ve done. President Obama: Don’t blame others for your failures. The new iPhone sounds pretty awesome. Activists on a Gaza-bound Turkish ship seized four Israeli marines before other commandos stormed aboard using live ammunition, a Lebanese cameraman said in an account on Thursday that echoed elements of Israeli testimony. . . The account from Andre Abu Khalil, a cameraman for Al Jazeera TV, echoed other testimony, from both sides, that after an initial landing by a small group of commandos armed with anti-riot weapons was overpowered by activists wielding sticks, a second wave of marines stormed in, killing those in their way. . .
UPDATE: Actually, it occurs to me that it’s a good thing the “humanitarian” thugs took those soldiers hostage. That’s probably the only reason they survived. Charles Johnson catches Reuters in two separate cases of cropping photos from the Mavi Marmara incident to remove weapons carried by the “peace activists”. UPDATE: Reuters claims it was an accident. That might be more plausible if Reuters didn’t have a record. In a situation like this, a simple “good riddance” doesn’t suffice. This woman should have retired years ago, but I’m glad she didn’t. If she’d retired a week ago, the world wouldn’t know what a dirtbag she is. Now she can enjoy some well-deserved ignominy in her retirement. The incident does revive the issue of whether it is appropriate for an opinion columnist to have a front row seat in the WH briefing room. That is an issue under the jurisdiction of this board. We are actively seeking input from our association members on this important matter, and we have scheduled a special meeting of the WHCA board on Thursday to decide on the seating issue. I’m sure they will exonerate themselves, but I’m glad they’re feeling a little discomfort. Can we do away with all of the shock and dismay at Thomas’ statement? Spare me Lanny Davis’s wounded outrage. Everyone knows she is a nasty piece of work and has been a nasty piece of work for decades. . . Suddenly, all of these people and groups are stunned to discover that Helen Thomas is . . . Helen Thomas. Feh. Well, I think that taking a pro-Holocaust position is a bit further than even Helen Thomas has gone before, but his point is well taken. UPDATE: John Hinderaker notes that the New York Times has yet to cover the story in its print edition. Is there any low to which the SEIU won’t stoop? Now it’s interrupting blood donations in a strike against the American Red Cross. The Boy Scouts and Baptist churches are also on unions’ enemies list. Demanding higher wages and better benefits, the Service Employees International Union on Wednesday launched a three-day strike against the Red Cross’ blood donation operations. The job action comes as the nonprofit, in a realistic response to the weak economy, is cutting salaries, ending bonuses and reducing pensions. SEIU thinks its members should not only be exempt from the Red Cross’ efforts to live within its means, but actually get a raise. SEIU: Give us more money or people will die. The withdrawal of federal tax credits for home buyers led to a steeper-than-expected plunge in May home sales in much of the U.S., as the housing market struggles to wean itself from government support. Economists and real estate analysts expected home sales to slow after the tax credit, of as much as $8,000, expired at the end of April. But early data from real estate brokers indicate that the sales decline has been far more substantial than expected, with some markets showing declines of 25% to 30%. Once again, stimulus spending doesn’t work. President Obama has had some legislative victories, but on the executive side his presidential campaign is still the only thing he has run effectively. ABC News’s deputy political director is leaving to join SEIU. Note that it was party leaders telling Democrats to avoid contact with their constituents. Using data spanning four decades, Harvard researchers measured the effects on local businesses as their local congressmen grew in stature in Washington. The study correctly assumed that when a senator or representative acquired a powerful committee assignment, he would exploit his new position to funnel more money to constituents back home. But the Harvard researchers also assumed — incorrectly, they would discover — that local businesses in a member’s home state or district would benefit from opening up the federal largesse. “It was an enormous surprise, at least to us, to learn that the average firm in the chairman’s state did not benefit at all from the unanticipated increase in spending,” said Joshua Coval, one of the study’s three principal authors. In fact, the study found that in the years following a congressman acquiring a powerful committee assignment, the average company in his state cut back capital expenditures by 15 percent. . .
An Army intelligence analyst has been arrested for leaking classified documents to WikiLeaks. The analyst is allegedly responsible for the helicopter attack video that WikiLeaks misleadingly promoted a couple of months ago, and various other breaches, including a leak of 260,000 (!) classified diplomatic cables. They need to lock this guy up and throw away the key. Whether it was his purpose or not, he gave aid and comfort to the enemies of the United States. Which must be read in its entirety. ALSO: Hearst may be dithering on whether to dump Thomas, but her agent is dumping her. It’s now legal to carry handguns in Tennessee restaurants. Restaurant owners can opt out if they which, though, so the new law doesn’t infringe on their rights. The U.S. Census purposefully hired more workers than it needed, telling the Office of the Inspector General of the Commerce Department that it did so as a “cost-saving measure,” according to a memorandum that Todd J. Zinser of the inspector general’s office sent to Census Bureau Director Robert Groves last week. It’s also interesting in light of yesterday’s jobs report, which found the Census was the sole driver in hiring last month. Without the Census, unemployment would have risen from 9.9% to 10%, but the Census alone drove it down to 9.7%. Were they looking to goose the unemployment figures? President Obama’s Justice Department announces a criminal investigation into the BP oil spill, and then Obama gets upset that BP may be “lawyering up”? What did he think was going to happen? How this guy got a reputation for being smart is beyond me. He certainly isn’t any good at anticipating the consequences of his actions. The unemployment rate fell in May to 9.7%, on the strength of 411 thousand people hired by the government for the Census. If you discount the Census hiring, the unemployment rate actually rose slightly from 9.9% to 10%. It would have risen more, but falling employment (even including the Census) was countered by people leaving the work force. Yeah, as long as the government can hire 411 thousand new workers each month. Er, never mind. Let’s not give them any ideas. I’m sure he’ll say it was just a joke, a hyperbole. Still, it’s telling when a politician jokes about fascism. I knew that Helen Thomas was a leftist nutcase, but I didn’t know that she was also a barking anti-Semite. In a short interview, she says that the Israelis should “get the hell out of Palestine” and go back “home”: to Poland and Germany. So Thomas says that the nation that was founded to prevent a repeat of the Holocaust should dissolve itself, and its people should move to the nation that perpetrated the Holocaust or the nation in which it was carried out. That’s pretty blunt. UPDATE: Thomas wants to un-ring the bell now. No dice. Once you’ve come out pro-Holocaust, deep regret and I-really-meant-just-the-opposite aren’t going to cut it. UPDATE: Hearst Newspapers won’t say whether Thomas will lose her job over this. It sounds like they want to see if it blows over. William Randolph Hearst’s papers were among the few to take the Holocaust seriously at the time, so it’s particularly sad to see them today sheltering this woman. “The Foreign Press Association strongly condemns the use of photos and video material shot by foreign journalists, now being put out by the (military) spokesman’s office as ‘captured material’,” the FPA said in a statement. It said the military was selectively using footage to back its claims that commandos opened fire only after being attacked. Israel denies that any of the videos are captured, but that’s really beside the point. Israel is justly concerned that anyone who chose to be on that boat would be likely to suppress any material that would support the Israeli side. (Indeed, those concerns have been pretty well borne out by now.) And Israel feels that defending itself is much more important than protecting intellectual property, particularly the intellectual property of its enemies. POSTSCRIPT: This is via Power Line, who also have two more videos showing that the “humanitarians” were violent thugs. Now, some of you may have noticed that we have been building this foundation without much help from our friends in the other party. From our efforts to rescue the economy, to health insurance reform, to financial reform, most have sat on the sidelines and shouted from the bleachers. As Obama well knows, the truth is quite the opposite. He wanted us on the sidelines! His problem was that we weren’t on the sidelines; we were in the fight, doing everything we could to stop him. When the Democrats rejected all our proposals and committed themselves to aggrandizing government, we had nothing else to do. I have found a reason to love the Cash for Clunkers program: it is a fabulous demonstration project for just how utterly pointless government stimulus programs can be. Stimulus programs tend to be hard to evaluate in our complex economy — sort of like trying to calculate the effect of a butterfly flapping its wings on world climate. But since cash for clunkers only lasted a few weeks and hit only one industry, we can learn a lot about the effectiveness of government stimulus. The central challenge is straightforward and stark: The rising costs of health care will put tremendous pressure on the federal budget during the next few decades and beyond. In CBO’s judgment, the health legislation enacted earlier this year does not substantially diminish that pressure. In fact, CBO estimated that the health legislation will increase the federal budgetary commitment to health care . . . by nearly $400 billion during the 2010-2019 period. He went on to say that the picture is better in the second decade “if the provisions of the legislation remain unchanged”, which everyone knows won’t happen. Gee, perhaps the CBO could have told us that in March, when it might have made a difference. But that’s not fair; the CBO did tell us that, as far back as July 2009. The Democrats just refused to listen. Haitian “social justice” groups want to burn relief aid from Monsanto. And it’s not even genetically modified. The Los Angeles Unified School District school board wants all public school students in the city to be taught that Arizona’s new immigration law is un-American. The school board president made the announcement Tuesday night after the district’s Board of Education passed a resolution to oppose the controversial law, which gives law enforcement officials in Arizona the power to question and detain people they suspect are in the U.S. illegally when they are stopped in relation to a crime or infraction. . .
I’m sure the LA public schools were rife with political propaganda already, but now they’re adding it as official policy. Last July, the Obama administration’s “auto czar,” Steven Rattner, unexpectedly stepped down after guiding the federal government’s bailout of the auto industry for five months. Rattner kept quiet when he resigned, but associates told news outlets that he was leaving because the auto companies were emerging from bankruptcy and his primary work was coming to an end. In fact, Rattner was also being advised by his lawyers to make himself a lower-profile target for federal and state investigators who were probing whether he had paid off a middleman to win a lucrative contract from New York’s pension system while he worked on Wall Street, a government source said Wednesday. But stepping out of the limelight did little to get the bull’s-eye off his back. The Securities and Exchange Commission has pressed recently for a settlement of its investigation that would ban Rattner from working in the securities business for up to three years, two sources familiar with the case said. Such a penalty could spoil his dream of returning to a prominent post in Washington. Rattner’s time as auto czar was either a complete failure or a smashing success, depending on whether his job was to restore GM and Chrysler to productivity, or to protect their unions. If he thinks his dream of returning to Washington is still alive, that tells you what he thought his job was. So reports CNBC. Of course, this was predictable: all the government’s efforts to reinflate the housing bubble would work for a time, but market realities had to set in eventually. If there’s one way to summarize Democratic economic policy, it’s a refusal to acknowledge market realities. They persist in believing that they can steer the market, and when their policies have unintended effects, they blame the market. But while the research compiled in the Dartmouth Atlas of Health Care has been widely interpreted as showing the country’s best and worst care, the Dartmouth researchers themselves acknowledged in interviews that in fact it mainly shows the varying costs of care in the government’s Medicare program. Measures of the quality of care are not part of the formula. The story points out many flaws in the Dartmouth analysis, beyond the obvious cheaper-is-not-necessarily-better flaw. But don’t give the NYT too much credit for running this story on the front page now, months after Democrats rammed their atrocity down our throats. The flaws in the Dartmouth study have been known since a critique appeared in the New England Journal of Medicine in mid-February. At the time, the NYT gave the story the page sixteen treatment. More details on the Mavi Marmara ambush. 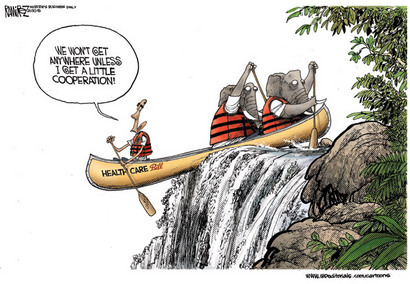 How much of a debacle will the implementation of Obamacare be? Here’s an indication: the Department of Health and Human Services has already missed four deadlines. She defended the administration’s approach on one of the missed deadlines – a requirement under the health-care law that HHS publish “a list of all of the authorities provided to the secretary under this act” on its website. “Now it looks like the simplest job assigned to the Obama administration – outlining its own new authorities and responsibilities — was so daunting that HHS decided just to reprint the table of contents from the new law until they can sort things out,” said Lisa Miller, a spokeswoman for Rep. Joe Barton of Texas. They literally printed the bill’s table of contents and said that satisfies the transparency requirement. That gives us a lot of confidence in the care they’ll put into running health care. POSTSCRIPT: One of the deadlines was actually mathematically impossible to meet. I suppose HHS is off-the-hook for that one, but it sure doesn’t make the bill sound any better thought-out. In the Supreme Court’s decision in Berghuis v. Thompkins, Sonia Sotomayor (in dissent) makes an argument that I find quite frankly bizarre. The case arises from an interrogation in which a suspect (Thompkins) remained largely silent for nearly three hours before confessing to the crime (a homicide). By a 5-4 vote, the Court found the confession admissible. The Court concludes today that a criminal suspect waives his right to remain silent if, after sitting tacit and uncommunicative through nearly three hours of police interrogation, he utters a few one-word responses. The Court also concludes that a suspect who wishes to guard his right to remain silent against such a finding of “waiver” must, counterintuitively, speak. Well, that’s one way you could guard that right, I suppose. But Sotomayor misses the obvious way in which you can guard your right to remain silent: by remaining silent! The whole case arises from the fact that Thompkins eventually broke his silence and confessed. If he had actually remained silent, there would have been no case. Apparently, Sotomayor and the other three liberal justices want to divorce the concept of a right to remain silent from its commonsense meaning. Most people understand the “right to remain silent” simply to mean that you aren’t required to speak to the police. But to Sotomayor and the liberals, the “right to remain silent” is a legal thing in itself that you must specifically waive in order to speak to the police. Bizarre. Mark Tapscott’s latest column warns us of a new publication from the Federal Trade Commission proposing to “reinvent journalism”. The FTC notes that the news industry is in trouble (no argument there) and looks for ways to save it. The first problem is it just isn’t true. The definition of a public good is a good that is non-rivalrous (one person consuming it doesn’t reduce its availability to others) and non-excludable (no one can be excluded from consuming the good). Public goods are interesting because they suffer from the free-rider problem in which they are underprovided because no one will pay for them. One solution to the problem is for the government to pay for the good. The non-rivalry condition applies, but the non-excludability condition does not. A journalist who gathers news and writes a story can sell it only to those who pay for it. No one else can sell the same story without infringing the author’s copyright. It’s true that someone else can read the story and incorporate its facts into a new story, but second-hand reporting is a very different (and less valuable) product than first-hand reporting. “Hot news” protection: A journalist who discovers a fact is given a property right in that fact itself and not just on his story reporting it. Other journalists would be barred from reporting that fact for a time. Licensing the news: The media would not sell stories but license them, using a restrictive license to limit what the consumer could do with them (as is commonly done with software licenses). And of course, the one you’ve been waiting for: direct government funding of the press. To be fair, they also include a few proposals that are non-horrifying, but these are enough. Any one of these would severely damage our free and independent press. If most or all were implemented, we would be left with a government-funded (and therefore government-controlled) media cartel controlling all discussion of the news. The good news is this is just a discussion draft. It specifically disclaims being the position of the FTC or any FTC commissioner. So there’s still time to nip this thing in the bud. You are currently browsing the Internet Scofflaw blog archives for June, 2010.